12x18 - Reflective Rust-Free Heavy Gauge Aluminum Historic Route 101 Sign. 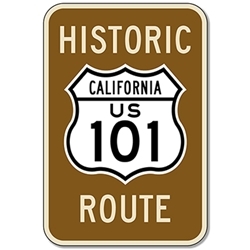 No need to be a Californian to enjoy this reproduction of the US highway sign for "Historic Route US Route 101". U.S. Route 101, or U.S. Highway 101, is a north–south U.S. highway that runs through the states of California, Oregon, and Washington, on the West Coast of the United States. It is also known as El Camino Real (The Royal Road) where its route along the southern and central California coast approximates the old trail which linked the Spanish missions, pueblos, and presidios. DOUBLE the working life of your Historic Route 101 by adding 3M Protective Overlay Film (POF)! 3M’s high-tech POF protects sign faces against fading caused by the sun and harsh weather—and makes graffiti defacement damage easy to clear away without harsh abrasives.